WOW! What a weekend at my household this weekend! Incase you are not up to speed I’ll give you a quick recap! This weekend started off with National Half Marathon packet pick-up, entering (my very first cake competition) into the NCACS’s cake show, RUNNING the half marathon, baking over 200 cupcakes, competing in NCACS’s Cupcake Cocktail challenge, going to a 3 hour professional class on Air Brushing (Food grade), and finally checking out the award show for the weekend’s competitors/ decorators! If you think you’re tired from reading all of that, I’m exhausted…. and would do it all over starting tomorrow! Obviously I am not going to blog ALL of that in one post, there is too much to say. Instead this week is going to have the wrap up of my cupcake cocktails, Air Brushing Class, and of course the Half Marathon! BUT for now I am way to excited to not to post my “Special Occasion/Novelty - Tiered” cake. I hope you enjoy! I discovered NCACS (National Capital Area Cake Show) back in November but never thought much of it again until the new year rolled around. 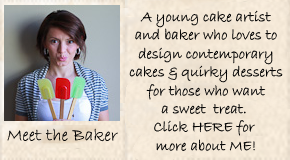 I registered first and then started pondering ideas for my cake theme. Sadly the only thing on my mind these days is Triathlon, and thus my inspiration grew from there. I always imagined that a “Tiered Cake” would have to be at least 3 levels, and being so wrapped up the the tri world these days I couldn’t think of anything else in the world happening in 3s! Starting from the bottom up was the swim, bike, run, and the cake topper was the grand finish! I promise to keep the chatter to a minimum and let you enjoy the process! I had a blast making all of the wetsuits… not so much all of the hands! As shown in the second and third last pictures they were a little tedious! But in the end I think they really came out clean and I became much much more efficient at them! On to the bike! (I actually became so engrossed in making the bikes that I forgot to take a lot of pictures along the way) But please take a peak at the pedal crank and water bottles on both bikes, they were my proudest features!! Then I moved on to the runner! This is the cake topper and I knew it had to really be an eye catcher! Having never competed in a full ironman event (though sometimes I think being the cheering fiancée and training partner has to count as some sort of participant!) I have witnessed the finishing shoot pride and adrenalin and really wanted to do it justice. Then comes all of the other details that Pull it all together! I may or may not have used the cherry blossom trees to my advantage! I figured that they might draw a little extra attention with the home crowd, and they ended up be a really big hit! Though I will admit that the water cup trail from the aid station was a little feature that made me smile every time! I’m sure by now you’re wondering “ how long did that cake take?”, but it wasn’t that bad. It SEEMED like it took forever because I was putting in an hour of time here and there, and in the mean time the cake waited patiently on the kitchen table and counter! 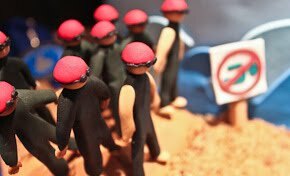 I think the person who suffered the most from the cake creation was The Boss; he loves to cook, and lately his space has been limited! But I have to give him a lot of praise because he was truly a good sport about his kitchen being short of destroyed over the past two weeks, and he is certainly my biggest supporter! In the end I think he was pretty pleased! After all he did come to the award show with me!! Here I am thinking I’m on top of the world because I WON! I won the 1st prize in my Category (The tiered occasion thing that I keep repeating)! But there were other categories as well in my Division (Adult Beginner) such as” specialty non-tiered”, “Under the Sea” (this was the theme this year), “Sculpted cakes”, and wedding cakes. In total there were over 50 some cakes in my division and to be honest when I dropped my cake off on Friday night, I double checked that I was in the right area!! These “Beginners” were pretty freakin’ fantastic! Intimidating too! They were all in Chef’s Jackets and had special cake carts/ carrying boxes. I was a little deflated! Then the unthinkable happens (Literally, I didn’t know there were more awards other than “category awards”)! The Boss and I went to the awards ceremony to see the other winners cakes and clap for all of the contestants. I caught wind that I might actually get my picture on the slide show! That’s it folks! I’m exhausted! I really hope you enjoyed the journey of this cake; I had a blast making it! Be sure to poke back tomorrow, I’ll be posting about the Cupcake Cocktail Challenge! That too was a lot of fun… and I just may have created two of my favorite cupcake flavors!! Congrats, I have been watering and just thinking of looking for you with a gallon of milk in hand. Every time you post something about a sweet all I can think is wow and where is my milk. Congrats on the win, it really does look awesome. This is fantastic, congratulation. that cake surely looks good. that cake is absolutely fabulous!!!! wish i could see it in real life. What a cool cake! Congrats on the win! CONGRATULATIONS!!!!! I'm so happy for you - what a wonderful cake!! Good for you!!!!! You are amazing! Your cake looks fabulous and you totally deserve the blue ribbon! Congratulations! Awesome!! Fantastic job. Love the details of the cherry blossoms and the little people. That cake is amazing! Such talent! Congrats on the big win! Congrats! My wife and I voted both voted for your cake so you're welcome :P I took lots of pics of it and it took me a while because I was so focused on the swimmers and bikes but I was like "look, those are all the cups that people throw on the ground!" There was so much to take in. I heard Saturday was a zoo, we went on Sunday. Anyway, great job! amazing!!!! I tried to find it on Saturday night but the doors were locked. congrats again! Sorry I missed you guys at the National Marathon. I thought I saw you coming through in the last mile (I was standing at the half/full split) and cheered, but after running into Ray yesterday and talking about the race, I think it was the wrong person...no wonder they didn't look like they heard me! Congratulations! That's quite possibly the cutest cake ever. Wow, what an awesome cake. Awesome cake and congrats on the win! I love the cake! You are a rock star! Popped over from the boss's blog. 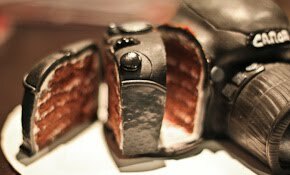 ;) AWESOME cake! Congratulations! And congrats on the big running PR too! I love the tri cake. LOVE. Congrats on the win and on your awesome race! That cake is amazing. I'm a little bit in love with the trail of cups too. So creative and original!! Well, I saw this cake in real life, and it was definitely the winner. Congratulations! This cake is amazing! My husband does triathalon's and this is perfect! Wish I had this cake when my daughter won her first Age Group Triathlete World Title in Budapest this past September. Your cake would have been a perfect way of celebrating her world title and her 21st birthday. Congratulations to you! Wow, great job!! I love your swimmers waiting for their wave and the trail of cups and really the whole thing is awesome! A medal very well deserved, way to go. Sounds like congrats on your half are in order too... way to rock the weekend! As a 2-time Ironman and a cake baker, I'm doubly impressed. Many congrats! Great job on the cake and the win! Love the aid station and details of the swimmers hands. Great work! So proud of you! Hopefully you can have a relaxing week after all of your hard work. Can't wait to read about your cupcakes. WOW! I've been looking forward to this post, and wasn't disappointed. 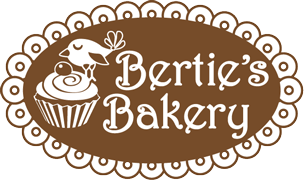 You have a gift, you'll have an amazing bakery someday! keep developing that talent and you will be untouchable, hey wait, you already are. PS: great run. . . you truly are an inspiration. congratulations ! i was so excited for you ! what a great result and i LOVED the cake. 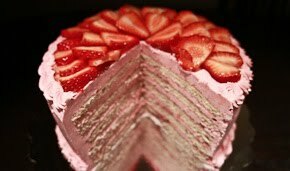 My friend, Sugarmagnolia70, turned me on to your cake. It's awesome and must have taken so much time! Congratulations on such a great accomplishment! This is fantastic! I am extra impressed because I can't bake/make food at all. I screw up the cookies that come in a pre-cut loaf. A friend sent me the link to your cake. Congrats! It's amazing. Loved your attention to detail -- like the trail of water cups away from the water station. is every part of the cake edible? what are the athletes made out of? Just came here from Sweetopia's site. I am blown away by this cake. It is awesome and you are awesome. What a talent you have! Congratulations on the 1st prize ribbon. All I can say is WOW! This cake is amazing...no wonder you won!! I love the little cups after the water station...really cute touch! You and DC both rock!!! Girl... you rock! 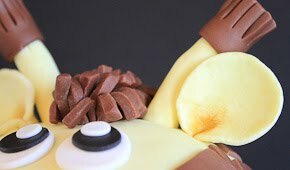 I stumbled onto this post while I was looking for inspiration for an IronMan cake. I too am a spectator/Sherpa and not a triathlete myself. 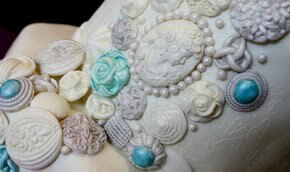 I have decorated cakes (mostly wedding) in the past- but have never attempted to mold figures. The Cherry Trees are amazing and I loved the water station! That detail shows that you have been in the trenches of a triathlon!! I know this post is from a few years back, but congratulations on your fabulous cake!! Sure wish I had your talent! Two Tier St. Patty’s Day Cake! ABC’s of ME: More than you ever needed to know! Fake Cakes and Cake Fakes!